Microsoft has set up an artificial intelligence and Internet of Things (IoT) laboratory in Shanghai, China. 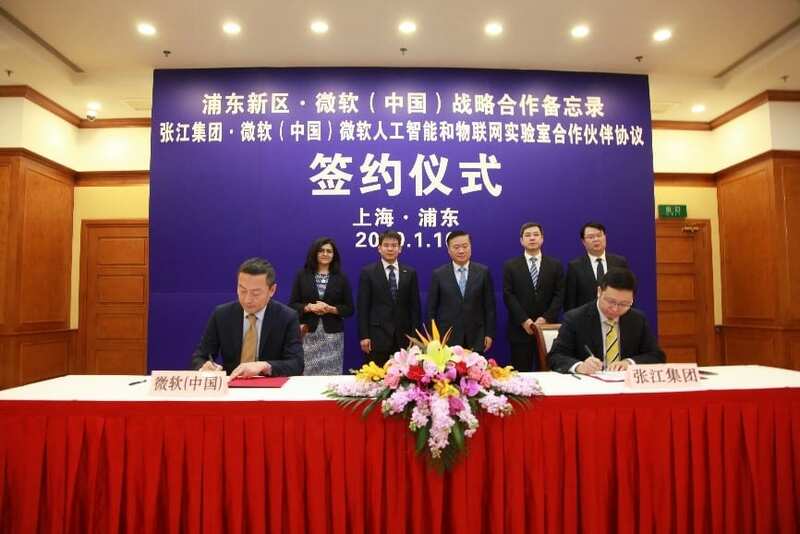 A news release from Microsoft China said the company has signed a strategic cooperation agreement with the district government of Shanghai Pudong Area to promote the deep integration of IoT in manufacturing, retail, healthcare other industries. It said the two sides have continuously developed technologies in the fields of transformation, industrial intelligent manufacturing, business model innovation, and created an innovative ecosystem of industry, enterprises and talent pooling. In setting up the lab, Microsoft is banking on government policies, industrial support, and Zhangjiang's scientific research community to create new opportunities for enterprises. Located at Zhangjiang Science City Artificial Intelligence Island, the laboratory is going to be Microsoft's largest global artificial intelligence and IoT laboratory with a total area of ​​2,800 square meters. It is scheduled to start operation in April 2019. Kang Rong, vice president and general manager of marketing and operations at Microsoft Greater China, was quoted in the statement as saying that the digital transformation led by innovative technologies such as artificial intelligence and Internet of Things is setting off a new round of industrial revolution around the world. Moreover, the Shanghai Pudong New Area has created an ideal development environment and policy support for technological innovation. Pudong, which means literally "the east bank of the Huangpu River," is a district in Shanghai that is now administered as a new state-level area extending to the East China Sea. Many of Shanghai’s landmarks such as the Oriental Pearl Tower, the Jin Mao Tower, the Shanghai World Financial Center, and the Shanghai Tower are in Pudong. But the area also now includes the Zhangjiang Hi-Tech Park, which specializes in specializes in research in life sciences, software, semiconductors, and information technology. Microsoft (China)’s AI and IoT Lab is also partnering with the Zhang Jiang Group in providing end-to-end localized innovation services for IoT solution development companies such as creative incubation, optimized product architecture, build solutions, technical support, and industry collaboration.